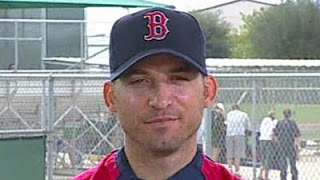 I give you Sir Marco Scutaro. I didn't bother to watch this actual interview where he looked directly at the camera and said "My sh*t? You must be kidding me. My sh*t, it does not stink. Roses my friend. The fresh aroma of roses." This is of course considering that Marco Scutaro is some smooth talking European romance artist that woos women with his sultry voice and quick witted quips about his travels through France with just a backpack and and a notebook. That's not how you picture Marco? My bad.